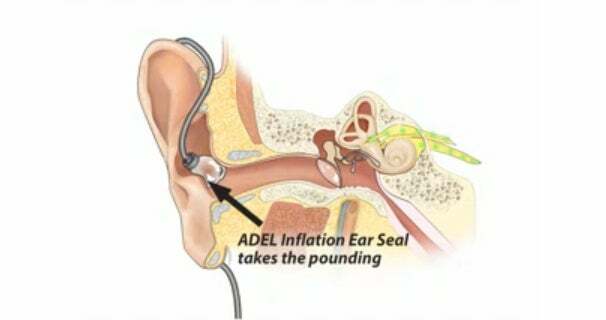 Screenshot from a video describing the ADEL earbud technology. See the video below. We’ve all been on a train listening to our tunes, then as the rail car starts banking on a turn, the wheels start screeching, and our first instinct is to turn up the volume. We think that more sound-isolation--in the form of in-ear headphones--will help, but as Stephen Ambrose tells it, we actually want balloon-like earphones that disperse the vibrations that normally bounce around inside of our heads. The technology is called the Ambrose Diaphonic Ear Lens (ADEL), and it’s a 2.5-micron thick polymer membrane that supposedly goes where your ear bud sleeves normally go. The membrane inflates thanks to the subminiature Asius Diaphonic Pump mounted in line or on the tiny drivers used in earphones. At the same time the seal is entirely flexible and responds to changes in sound pressure, rerouting the acoustic energy. The acoustic energy or sound vibrations are normally generated by the audio drivers in headphones, but the effect is also damaging to the ears. Say you were wearing a pair of Shures with expanding foam sleeves or Ultimate Ears’ custom molded from wax poured into your ears; the vibrations couldn’t go anywhere but rattling on inside of your head like a piston. Ambrose Diaphonic Ear Lens redirects the energy to the outside world saving ear drums. Also we may be able to hear our tunes at even lower volumes because the human body has a natural defense reaction called the stapedius reflex, which tenses the muscles supporting the middle ear; dampening the energy reaching the cochlea by as much as 50 dB. As headphones have a tendency to distortion at higher decibels, we might actually be able to start hearing the undistorted lo, mid, and high bits of our music. And be sure to check out Sound + Vision’s impressions on the Ambrose Diaphonic Ear Lens earphones in action. This story, "Self-Inflating Earbuds Could Save Ears--and Tunes" was originally published by PCWorld.